9月 | 2008 | la Federacio de ChifonProletoj/自由労働者連合荊路伴/F.W.F. *we made some original T-shirts of FWF!! 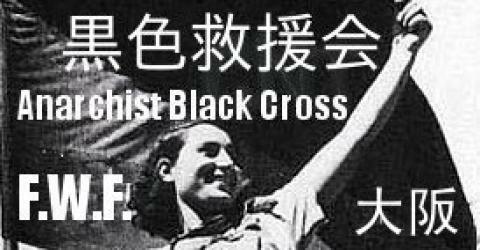 saluton from the “Kokushoku-kyuuen-kai”=ABC-osaka and the Free Workers’ Federation(FWF)! by the way, we try to get the power for reliefing activities of comrade_Y and other protesters being prisoned as the “riotters of kamagasaki on 13-20 jun 2008”. so, we try to sell some original T-shirts as an effort of better legal support for them. (especially for comrade_Y of FWF!) comrade_Y and some protesters are still prisoned at osaka prison. if you will be able to support them, please DO SOMETHING FOR THEM or make some donations for the “613 legal support committee” or “ABC-osaka”. anyway, following link url shows you some original T-shirts of the FWF and the “Night patrol of Fuse”. check it! thanx. in solidarnosc.